For that old time malt shop favorite, a malted milk shake, try our genuine Malted Milk Powder. This is the real deal, commercial quality malted milk used by restaurants, malt shops and soda fountains. We have the economy 2.5 pound canister for significant savings. Each sealed container comes with a reusable plastic lid. Barley Malt, Wheat Flour, Sucrose, Milk, Malt Extract, Salt and Sodium Bicarbonate. Great tasting Malt, great service. As advertised and as good as I hoped! Great malt! Great service! Thank you! This is what I've been looking for , it's been years since I've had a vanilla malt that tasted like the days when I was young, I just couldn't believe it when I first sipped on it, I had finally found what I've been looking for. I took a chance and man was I happy with you're product, I will order it again for sure.......you can bet on that. This is not the first time I have ordered this item nor will it be last. I mainly make Malted Milkshakes, just like the Old days. I'm a senior citizen. Prarie Moon Malt Powder...bought at local grocery story at half the price, now I know it was a great dea. After months of searching I finally found malted milk powder that makes the perfect malted milk shake! Thank you, Prairie Moon! 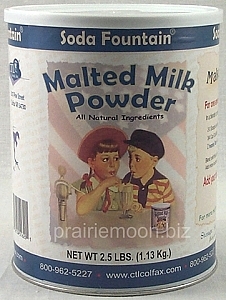 Prairie Moon offers a great Malted Milk Powder, as good as any I have ever tasted. The product comes nicely packaged and shipped fast. I will definitely order again. Best I've ever had! Shipping was really fast and was packed really well. Will order again! Don't tell ANYBODY. Keep this OUR little secret.THIS STUFF IS GREAT. I have an 11 year old son who needs some fattening up. Dad always used to hand me a shake back in the day when I was about my son's age. I looked far and wide for that crunchy Malted Milk taste and they all missed the boat. Carnation was a joke. Horlicks wasn't it. I didn't quit. Then I found Prairie Moon, totally by accident. Problem solved. Kid LOVES it. (Me, too...Uh-Oh) Just don't Tell ANYBODY. Hahahaha.. I have been ordering this item for a couple of years- can't compare to what you get (if you can find it) at the grocery store. The real deal!! !